Our online Psychometric Test Administration Course provides students with the ability to understand and competently practice the administration of ability, aptitude and personality assessments in organisational settings. Successful students will be able to apply to the British Psychological Society for the Level 1 Assistant Test User Qualification. Why the need for this course? We know from research that well designed and reputable psychometric tests are incredibly useful in candidate selection and employee development as well as in team-building, coaching and career development. However, in order to be useful such tests need to be administered properly. Deviation from standardised test administration, errors in scoring, improper storage or use of test data or simply not giving respondents the information they need can all lead to a reduction in test reliability and validity. This effectively makes the test useless and can have huge negative impacts upon you, your company and the respondent. 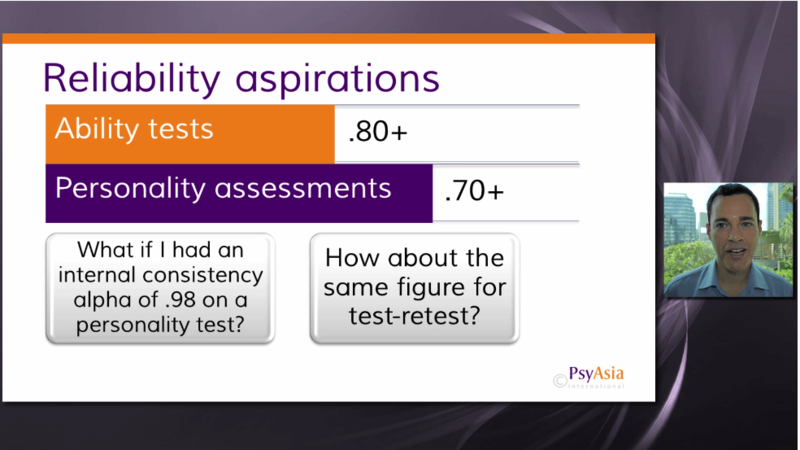 The content from this course prevents these issues by teaching you how to effectively prepare for and administer psychometric assessments. The course is divided into 4 Modules and the video play times are listed below, along with estimated time to complete assessments. Keep in mind that everybody is different and some will pause the video and take notes, whilst others will watch a video outright. You may need substantially more time than noted below if you prefer to take your time learning. Those on our Independent Mode of Learning will have 90-days to complete this Level of the course, whilst those in our Supported Intakes will have 4 weeks of training, plus 2 further weeks to finalise assessments. Will the course work on my system? Yes! We use the same platform used by the world’s top Universities and our videos stream from a world renowned content partner. You should be able to access everything on your PC, Mac, tablet and smartphone devices. When completing quizzes we recommend doing so on a full screen device for obvious reasons. Don’t just take it from us, let our valued students do the talking! Training was informative, sleek and world class- just the right amount of knowledge that one needs to be able to digest. The Online Training for Test Administration was an ideal solution for me. The program was delivered by a very experienced facilitator, the content was substantial and doing it online allowed us to attend the course in an environment that we are already comfortable in. I would highly recommend this course to management who are looking for a unique yet effective training methodology. Simply send us an email and we'll send you all the reviews we have! Our Independent Mode is a discounted option for those who prefer to learn principally at their own pace and who are unlikely to need interaction and support with other students or tutors. 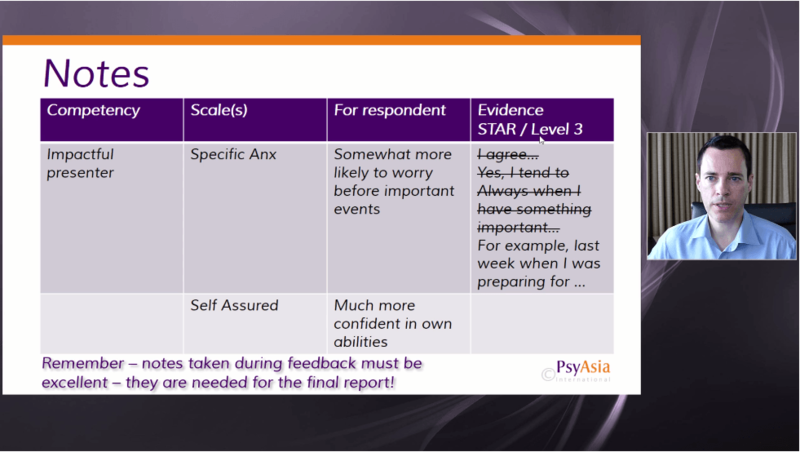 Independent Mode provides 90 days of access to EACH Level of the Psychometric Assessment at Work Course that you have signed up for. A generous additional discount is available for registering for all 3 Levels up-front. In this case, you will receive a 90-day enrollment in Level 1 initially. Once you have completed that, we will add a 90-day enrollment in Level 2 Ability, and once that is complete, we will add your 90-day enrollment in Level 2 Personality. Once your enrollment expires for a particular Level, you need to upload your portfolio of work to our secure server within 14 days for assessment. Enrollment includes one-time assessment of your portfolio of work for the BPS certification as well as shipping fees for us to send some on-loan materials to you (Level 1 only: materials are sent between 4-35 days after registration depending on how many other students are using them at the time) and mailing of our own Certificate of Competence to you after you successfully complete all Levels that you registered for. Additional but very reasonable fees will apply for one-on-one telephone/skype sessions with our psychologist for additional coaching and, fees may also apply for remarking work that does not meet the required standards and for work submitted outside of deadlines. Our Supported Intake Mode is more similar to traditional teaching. Here, rather than commencing the course on your own when you are ready, you instead join a particular Intake Group. The Online course will commence on the published date and each week, we will focus on one or two Modules. The Module(s) will comprise a number of training videos. Having watched these videos, you can then participate in our online forums with the other students of your intake to discuss the content and learn from each other and you can attempt our self-review quizzes to test your learning. Course tutors will log into the forums at least once per week and will either respond to the questions by reply, or use the questions to guide additional "RealTime" Videos or Webinars to cement learning. Our Supported Intake Mode is approximately 20% more expensive than our Independent Mode, but as you can see, you will benefit not only from the convenience of taking the course anywhere you like Online, but you will additionally benefit from the ongoing support of both students and tutors. As you move through each week of the course, you will complete various parts of your workbook and assessed practical exercises. You will then upload your portfolio of work to our secure server within 14 days of the end of the Level of the Online course that you have completed. Enrollment includes one-time assessment of your portfolio of work for the BPS certification as well as shipping fees for us to send some on-loan materials to you (Level 1 only: materials are sent between 4-35 days after registration depending on how many other students are using them at the time) and mailing of our own Certificate of Competence to you after you successfully complete all Levels that you registered for. Additional but very reasonable fees will apply for one-on-one telephone/skype sessions with our psychologist for additional coaching and, fees may also apply for remarking work that does not meet the required standards. PLEASE NOTE: FOR SUPPORTED INTAKE MODE, STUDENTS ARE EXPECTED TO KEEP UP WITH THE COURSE DIARY AND COMPLETE THE REQUIRED VIDEOS, QUIZZES AND ASSIGNMENTS FOR THAT WEEK. IF YOU ARE LIKELY TO HAVE TROUBLE ADHERING TO DEADLINES, PLEASE REGISTER FOR OUR INDEPENDENT MODE INSTEAD. In order to enroll in our Online Psychometric Training Courses, please contact us. Our friendly support people will be happy to discuss the training Modes mentioned and to quote you our current regular fees and any available promotions. Once you are ready to enroll, payment can be made by bank transfer into either our Hong Kong or UK bank accounts or via credit card. Kindly note that following successful completion of the course(s), we will, with your permission, submit your details to the British Psychological Society for Registration on their Register of Qualifications in Test Use. The BPS will then invoice you directly for the certification and registration fee. As with all BPS Level 1 & 2 Certification Courses, you will need to ensure that once you have your certificate, you fulfill the re-validation requirements every 6 years in order to continue to be certified. Quality, HD course slides fully narrated by our award-winning Chartered Psychologist using professional recording equipment. Quizzes at the end of each Module assess your learning. Our virtual whiteboard feature introduced in Level 2 ensures students grasp topics at the same level as those in the traditional classroom. Watch the videos over and over until you are happy with your understanding. For those on our Supported Intake Mode of Learning, we offer student forums in each Module where students can discuss the course topics. Our psychologist facilitator will monitor these forums and add his input and from time-to-time, he will record RealTime videos and arrange Webinars which elaborate on questions and points being made in the forums.